As I stated in my last tea post I don’t like to drink water. That is until now. I have discovered how to flavor my own water with fruits. When I first saw this I couldn’t believe that I hadn’t thought of it. I first tried this with mango. I had purchased one that I thought was ripe but after the first cut I knew it was not. I decided to continue to cut it up and try the flavored water idea. I cut it into small pieces and placed it in my glass tea pot. 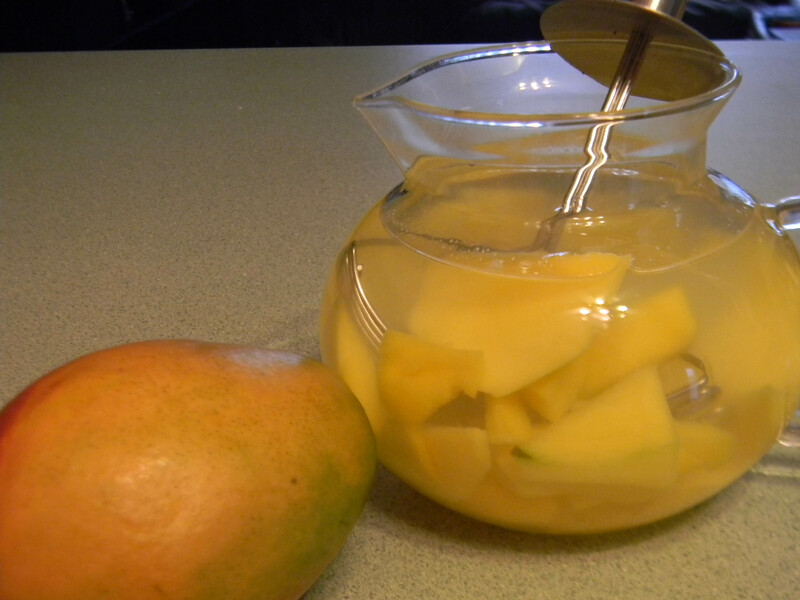 I added purified cold water and then tried to mash the pieces with my pastry cutter, it was a little hard because the mango pieces were firm. I probably should have used room temperature water. I then put the water in the fridge over night. 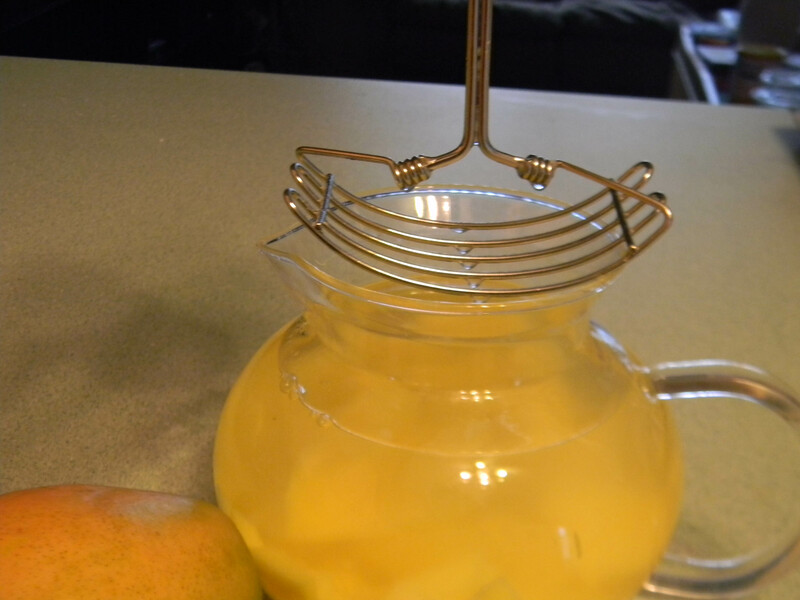 As I use the water I add additional water and crush the mango some more. The water tastes of mango and is refreshing. I am sure it would be sweeter if I had used a ripe mango. 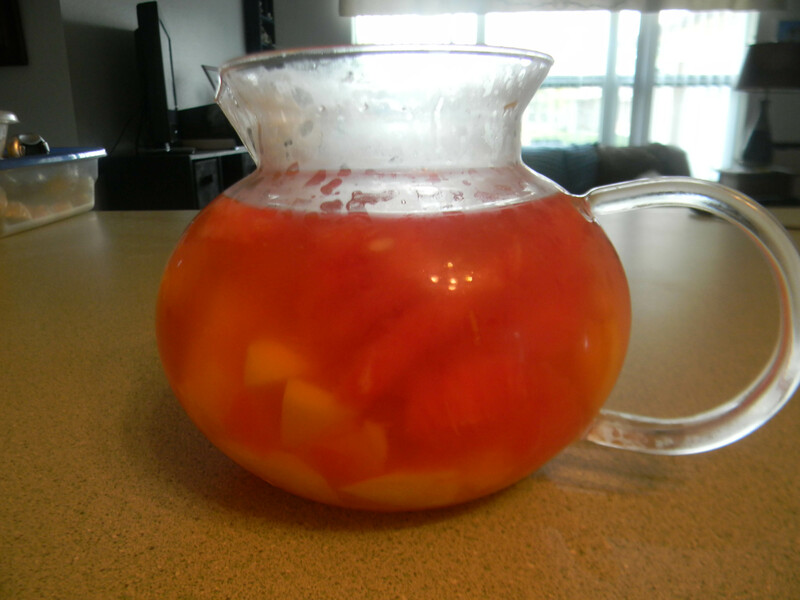 The next day I cut up a watermelon and decided to add some pieces of watermelon and the juice to the mango. BOY OH BOY, I really liked this. My next recipe will be strawberries and watermelon. You can use any fruit you want and any combination, except bananas. What combination will you try? This entry was posted in Drinks, Food and Drink, Posts and tagged fruit flavored water, homemade flavored water, mango, water, watermelon. Bookmark the permalink. Never heard of this…Very cool. I think I will try apple sometime. Also do cucumber water. Any melon is nice because it is so alkalizing. BTW. How large is your glass tea pot and where do you get them?